All the wood we sell is either a by-product of tree surgery work or sustainable woodland management, or is purchased from other local, managed woodlands, and is FSC (Forest Stewardship Council) certified. Thinning and coppicing woods is a necessary part of good management practice, and is very different to clearfelling (called clearcutting in the US and elsewhere), which simply means removing every single tree, or as good as, in a given area, and which is usually extremely bad for wildlife and the wider ecosystem. Our native woodlands contain a range of native species of differing ages, which support a wide range of wildlife, unlike forestry plantations, which are usually more or less single species of the same age, and therefore far less beneficial environmentally. Ideally firewood should be as dry as possible in order to get the maximum heat value from it, and to avoid tarring up the chimney or flue. 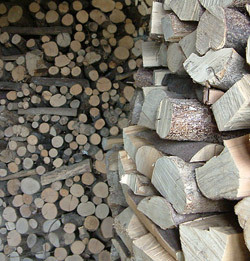 We recommend that customers buy firewood over the summer if possible in order to get it stacked up and dry before use. This also avoids the inevitable rush and potential delays in ordering during the winter when the days are short and demand is at its peak. For those who are interested in the disastrous effects of unsustainable global logging practices, we recommend Derrick Jensen and George Draffan's excellent book 'Strangely like War - The Global Assault on Forests', which should be mandatory reading for politicians and in schools. This describes how huge, secretive, and largely unaccountable corporations are destroying the world's forests for their own short-term greed, usually with the complicity of politicians. Sadly, this is true not only of forests, but the land, oceans, rivers and aquifers on which all life on earth, including human beings, depends, and this is occurring at an accelerating rate.